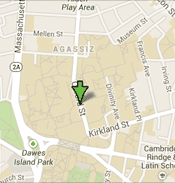 Our campus is part of the Harvard University campus located in Cambridge, Massachusetts. The main buildings are located just north of historic Harvard Yard (beyond the Science Center) and are bounded to the east by Oxford Street. To the west, across an oak-filled quadrangle, is the Harvard Law School. We are situated among the buildings housing the departments of Molecular and Cellular Biology, Systems Biology, Chemistry and Chemical Biology, Earth & Planetary Sciences, Mathematics, and Physics. In addition, SEAS has dedicated space (administrative offices; machining facilities; and future student spaces) in the Northwest Science Building, which houses some 520,000 square feet of "flexible" laboratories, classrooms, and offices. All tours and campus visits for prospective students and their parents, guests, and groups are coordinated through the Harvard Information Center (located in the Holyoke Center Arcade at 1350 Massachusetts Avenue in the heart of Harvard Square) and through the Harvard College Admissions Office. Please note that campus tours for prospective students are only offered through the Harvard College Admissions Office. In collaboration with the Harvard College Admissions Office, SEAS offers a school-specific tour. In addition each spring, admitted students will be contacted about opportunities to attend open houses and informational events (on campus and online) organized the Harvard John A. Paulson School of Engineering and Applied Sciences. Self-Guided Tour: For those who are unable to attend one of our in-person, SEAS-hosted tours, consider using our self-guided virtual tour at www.seas.harvard.edu/tour. Two of our buildings are also featured in the Harvard College virtual tour at college.harvard.edu/admissions/visit.